This is easily my favourite thing that has happened to me all week - and I went to Thorpe Park yesterday, and today was the end of term. BUT THIS BEATS EVERYTHING! We had an assistant head at school for half a year who unfortunately developed MND. He arrived in his new post in June, walking with a cane, and by Christmas he had a walker, and was signed off sick. It was very sad as he has young children, and he was a very sporty man. But he's a scrapper, and he became a major fundraiser for, and the face of, the MND Association - Alistair the Optimist. 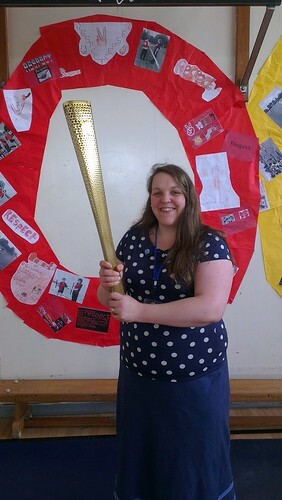 He ran a leg of the torch relay in Yeovil and brought his torch into school this week for the students to see. I was sorry to miss him because, though I only worked with him a short while, I found him very inspiring: my teaching job is named for one of his pet phrases. 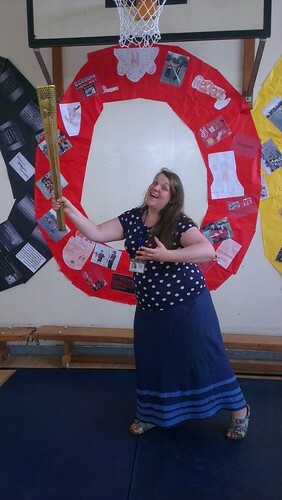 However, I did still get to have my picture taken with the torch!! SO EXCITING! I know there are a lot of people who are a bit humbug about the Olympics. To them I say - humbug.I am very excited about the whole thing!